It seems like we've been waiting forever for the Catherine remaster, originally announced nearly a year ago. The puzzle platformer was first released in Japan and North America during 2011, with a European launch the following year. It follows Vincent, who is having supernatural nightmares; he also finds himself torn between Katherine, his long-time girlfriend, and Catherine, most decidedly not his girlfriend. The ending is influenced by the decisions you make for Vincent along the way. The remaster, titled Catherine: Full Body, will be released in Japan on February 14 (perfect!) with a Western date impending. The game will be playable at TGS 2018, where we will be on the floor. In Japan there are two physical editions for purchase, the standard and the limited. As is customary, the limited edition included an art book, soundtrack, and special DLC. Catherine: Full Body does have some differences from the original. With over 500 stages, there is now double the gameplay. There are also 20 additional animated scenes. The best/creepiest part is that you can change the voice of Catherine. Two are available right away, Miyuki Sawashiro (Catherine’s main voice actor) and Mamiko Noto (Fuuka Yamagishi in Persona 3); nine other voices will be available via DLC, but these names are yet to be announced. Apparently, each has played an adulterous lover in the past. In the wake of a massive earthquake in Japan last week (we're sending our love from across the world!) the Nintendo Direct was delayed indefinitely. We won't need to wait much longer though, as it has announced the make-up time. 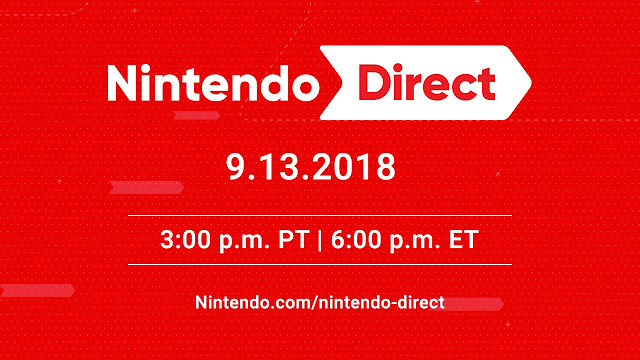 Nintendo has also announced when the Nintendo Switch Online service will launch: September 18. That's a lot of Nintendo for this coming week! Prepare to be scared this October, as The Midnight Sanctuary comes to consoles and PC. Set in the isolated Japanese village of Daiusu, the townsfolk look up to a mythical woman known as The Saint. They are no longer persecuted for their 'abnormal' religious beliefs, so they build a cathedral in The Saint's honour in an attempt to attract visitors. A famous historian is invited to Daiusu to help document its past and help locals become familiar with the outside world. The problem is, the locals are not... okay. People are disappearing and reappearing, some are jumping off cliffs, others twist themselves in half. But they're not necessarily dead. Visually, the game blends static textures and moving 3D models, an effect that is promised to be enhanced in VR. The Midnight Sanctuary will be released on October 4 for PC, PlayStation 4, PSVR, and Nintendo Switch. It will later be made available for Steam VR. Voice acting is available in Japanese, with subtitles and text being available in both Japanese and English. Deracine is an adventure game where the player takes on the role of lonely faerie at a boarding school. You move around a world frozen in time to collect information and solve a mystery. The world is quiet. The narrative is built through the information collected. The game will be released for PSVR on November 6 for the Western world, and November 8 in Japan. North Americans can get a physical edition via GameStop, and pre-orders for either the physical or digital edition includes a dynamic theme and six PSN avatars. European digital pre-orders include the game bonuses. There is a physical Collector's Edition available in Japan, including a soundtrack and special case in addition to the game itself.